Drive Medical Scout Review: Is It The Best Travel Scooter For You? Drive Medical Scout Review – Could It Be the Best Travel Scooter for You? The travel scooter is strong, reliable and comfortable. It offers a smooth ride every time while being easy to steer. Both the rear and front wheels are 8 inches in diameter and have a flat-free design. Thanks to them this travel scooter runs well even on rougher terrains. I was looking for the best way to enjoy the outdoors and do simple daily chores when I discovered the Drive Medical Scout power scooter. Is it comfy? Is it dependable? Get the answers to these and other important questions by reading my Drive Medical Scout review. It will certainly help you decide if this scooter is the right choice for you. The capacity of this travel scooter is 300 pounds – this is comparable to what heavy-duty electric wheelchairs have to offer. The scooter is naturally much larger measuring 42.5 by 21.5 inches. It weighs around 93 pounds when fully assembled. This is something which caregivers, in particular, should pay close attention to. While it’s fairly light for a motor vehicle of its type, it still requires some effort to put together and this is something worth pointing out in this Drive Medical Scout review. The scooter is very well made with its metal parts and heavy-duty plastic floor. I’m pretty confident that it will withstand the test of time. It’s also easy to disassemble – no special mechanical skills required. It is possible to pack it neatly for storage once disassembled. The seat is not among the widest or deepest that you can find given that it measures 16.5 by 16 inches, but it’s very comfortable. I appreciate the padding a lot. It’s not very big, but it’s sufficient to help you relax. In this Drive Medical Scout review, it’s worth noting that the seat is adjustable. You can set it at a distance between 17 and 18 inches off the floor, depending on your height. This is very convenient especially for those who are taller or shorter than the average. The backrest provides good support. The armrests are padded, which is very nice, but could be a bit wider. The amount of legroom is decent, but bigger is always better and I’m sure you’ll agree with me on that. How about Steering and Performance? The steering wheel has a delta shape and this is a huge plus for those who don’t have a high level of dexterity for one reason or another. Its height is adjustable so you should expect steering to be comfortable too. This is something which I wanted to highlight in my Drive Medical Scout review. The motor runs smoothly and quietly. It appears to be quite powerful. Both the rear and front wheels are 8 inches in diameter and have a flat-free design. Thanks to them this travel scooter runs well even on rougher terrains. With a turning radius of 53.75 inches, it’s hard to compare it to electric wheelchairs like EZ Lite Cruiser which is naturally much more maneuverable. Still, this is the price you pay for sitting on a platform, which naturally offers great stability. My answer to this question is yes. The battery gives you a range of 9 miles which is very good for a power scooter. Additionally, it’s easy to charge it and the process doesn’t take a lot of time. As a guy who’s big, I wish there was more legroom. 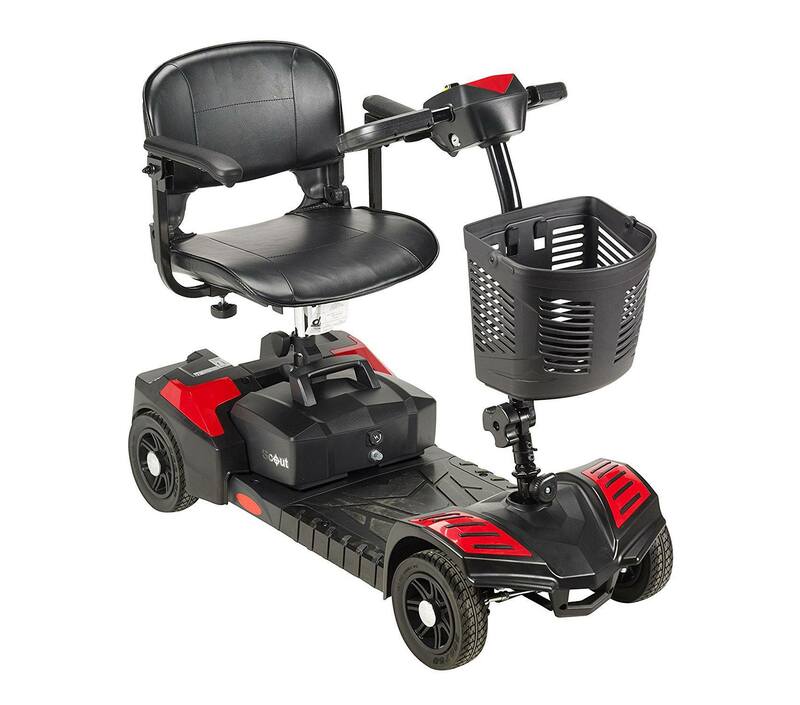 Still, I want to emphasize in my Drive Medical Scout review that what the scooter offers is perfectly sufficient. It’s just that when you get smooth performance and convenient steering, it’s natural to crave for more comfort. The verdict of this Drive Medical Scout review is that the travel scooter is strong, reliable and comfortable. It offers a smooth ride every time while being easy to steer. To discover more details and reviews, visit Amazon. 1.3 How about Steering and Performance? 1.4 Is the Battery Reliable? Previous Foldawheel PW 1000XL Review - Is It the Ultimate Choice for You? 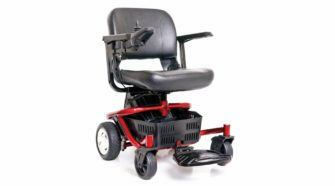 Next EZ Lite Cruiser Review - Can this Power Wheelchair Match Your Lifestyle? 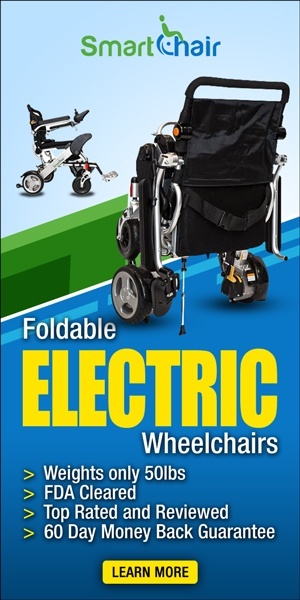 LiteRider Wheelchair Review – How Good Is the Envy GP162 Electric Travel Powerchair?